This is something a little different, Looking at doing a Sprint Vinduro on 20 acre property with creek running through the middle. Course would be approximately 5kms long incorporating crossing the creek(mainly dry) about 10 times, little wooded section and lots of flat and undulating grass sections which will require alot of bunting. There will be a nice flat grass camp pit area and majority can be viewed with in a short walk which be great for family and those pit crew helpers. Approximately 2:15 hour south of Perth, to Thomson Brook. 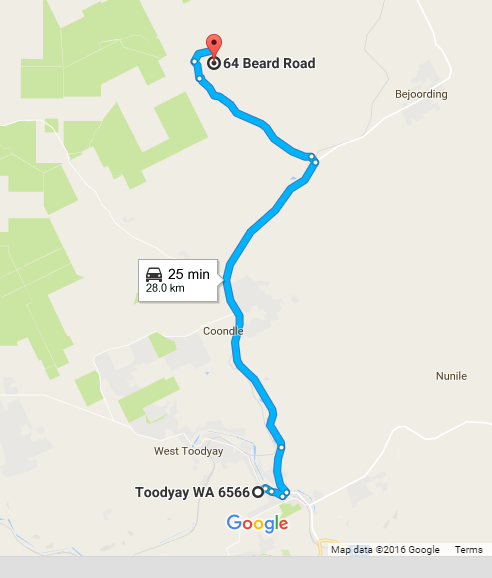 As shown on the Map below travel via Southwest Highway through Donny Brook travel about 2.2kms and turn left on to Donnybrook-Boyup Brook Rd approx 6.2kms you will need to do a right turn onto Charley Creek Rd. Travel approx 7.5kms and turn left, this should be sign posted Look for club signage or arrows after you turn off from the highway. Camping is available at the site. There will be toilets. Bring your own Water. A campfire(bonfire) will only be lit in one designated area. A club bbq will be available for members use. The only people allowed on the loop before 1.30pm Saturday are the designated track markers and officials. Saturday: The loop will be open from 1.30pm, last rider out at 4.30pm. All riders musted be signed out and in, to ensure all riders are accounted for. Sunday: The loop will be opened from 9am until last rider out 2.30pm. All riders must be signed out and in to ensure all riders are accounted for. Sign on from 12.30pm Saturday and 8am Sunday. You can sign on any time after the aforementioned times. All bikes will be scrutineered for safety. Riders must wear correct safety gear. Riders brief at 1pm(Sat) and 8.45am(Sun), safety brief to be given to all riders who turn up at other times. All bikes must be pre1995, the only modern bikes that will be used by designated personnel for safety reasons only. We do not wish to offend by having to tell someone their bike is ineligible. Please check if you have any doubts. As this is a non-competitive ride, you can arrive at any time after the start time and sign on, be briefed and have your bike scrutineered prior to entering the loop. All riders taking part in this event must be members of VinduroWA, paid the entry fee, be holder of a current MA licence or take out a one event licence. Event entry is $30.00 plus non-competitive licence ($30.00) if required, one day membership ($20) avail, full membership $70.00, Juniors $5.00 and $30.00 for licence if required, free one club membership for the day. Please bring a sense of humour, this is supposed to be fun. Remember constructive criticism! 13-14 Apr Canning Motor Trimmers Vinduro. After 6kms Turn Right into Beard road, we will have some signs out on the day at Telegraph Road turn off also look for club arrows, Black arrows, orange background. Remember all bikes must be pre 1995, they do not have to be licenced as we run on private properties. All Juniors must ride with either parent or legal guardian. As this is a non-competitive ride, you can arrive at any time after the start time and sign on, be briefed and have your bike scrutineered prior to entering the loop. All riders taking part in this event must be members of VinduroWA, paid the entry fee and either holder of a current MA licence or take out a one event licence. Sign on from 12 midday riding from 1.30pm. You can sign on any time after the aforementioned times. All bikes will be scrutineered for safety. Riders must wear correct safety gear. Riders brief at 1.00pm. Safety brief will to be given to all riders who turn up at other times. All bikes must be pre1995, the only modern bikes that will be used by designated personnel for safety reasons only. We do not wish to offend by having to tell someone their bike is ineligible. Please check if you have any doubts. The loop will be open from 1.30pm, last rider out at approx. 4.30pm. All riders musted be signed out and in, to ensure all riders are accounted for. Camping is allowed Saturday night, toilets only. Bring own water, no dogs. Please ensure you drink responsibly. Location: 5222 Yerminup Rd, Frankland River. Thanks to Grant Warburton for the use of his property. Sponsors: The Great Southern Weekender, Harv’s Tyres, Albany Motorcycles, BF Customs, Ray White Rural Albany and McIntosh & Son. Perth: Albany H’way to Kojonup, turn right onto Blackwood Rd (becomes the Kojonup/Boyup Brook Rd) turn left (approx. 6.7km) onto Konjonup-Frankland Rd (approx. 48km) turn left onto Yerminup Rd (6km) turn left into property approx. 2.7kms. Mt Barker: From the northern roundabout travel approx. 16.3km, turn left onto Martagallup Rd, travel approx. 15.1kms becomes Stockyard Rd, another 19.4kms turn left onto Frankland-Cranbrook Rd 16.7km continue onto Wingebellup Rd, 6.4km turn right onto Frankland-Kojonup Rd, 17.6kms turn right onto Yerminup Rd turn left into property approx. 2.7km. Boyup Brook: turn right onto Boyup Brook-Kojonup Rd travel approx. 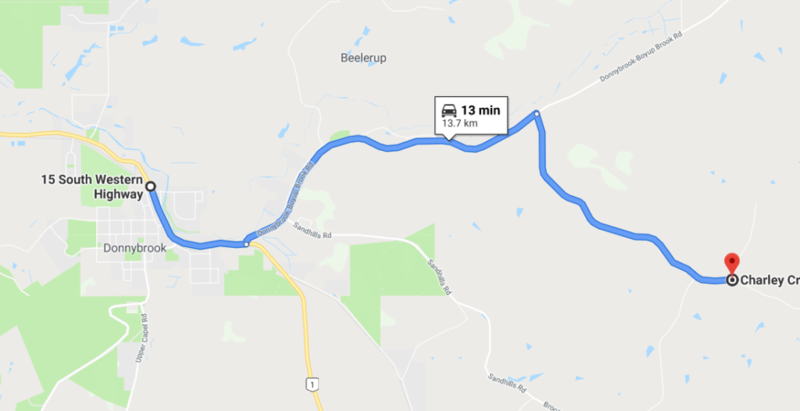 12.5km, turn right onto Boyup Brook Cranbrook Rd travel approx. 46.5kms, continue onto Wingebellup Rd for another 15.5kms, turn left onto Unicup Rd approx. 2.6kms turn right onto Bokerup Rd, approx. 15.4kms turn left onto Frankland-Kojonup Rd 7.1kms turn right onto Yerminup Rd 2.7kms turn left onto property. Normal Attendees: Must be members of VinduroWA by either purchasing a one event membership (once only) $20.00 or full membership $70.00, juniors (15yrs and under) receive a free one event club membership. Event entry is $30.00 adult, $5.00 juniors. If not holders of current MA licence, $30.00 for a one event non-competitive licence. Event: Non Competitive enduro on an approx. 10km long loop. Sign on from 12pm Saturday with the loop opening approx 1.30pm and closing approx. 4.30pm. Sunday sign on from 8am, loop opening 9am and closing approx 2.30pm. Only staff are allowed on the loop prior to opening. You can ride Saturday and Sunday or just on one day. As this is a non-competitive event you can sign on any time after the registered times. All personnel will be given a safety brief prior to entering the loop for the first time. Juniors: Must be accompanied by an adult whilst on the loop. Saturday night: Hot lamb rolls with gravy. Club BBQ also available. All riders are reminded they need to have ambulance cover in case of injury. Error: Error validating access token: Session has expired on Friday, 10-Aug-18 03:56:17 PDT. The current time is Thursday, 18-Apr-19 16:17:57 PDT.